If you’ve ever seen a Ford commercial, then you know Ford prides itself on the sturdiness of their trucks. So it might surprise you to know that the company chose to make the newest model of one of its most popular trucks out of the same material as flimsy soda cans. The new F-150 rolled out in November, and this year it has an all-aluminum body. The decision came about from Ford’s efforts to make a more fuel efficient, regulation compliant truck. The company tried other methods of improving the vehicle, but using aluminum was the clear winner according to Pete Reyes, the truck’s chief engineer, in an interview with Forbes. “If you can use technology and materials to take the weight out of the vehicle, you’ll always end up with the best solution,” Reyes said. The new F-150 body only weighs about 700 pounds, and the Wall Street Journal reports that across the new trucks variations, buyers can expect between 5 and 29 percent better fuel economy. Despite the truck’s fuel efficiency, however, potential customers and industry speculators have been wondering whether an aluminum-bodied truck take can the same kind of beating as the previous stainless steel models. Reyes assured that the new F-150 lives up to Ford’s tough standards. In fact, the heat treated 6,000 series alloy aluminum used on the truck can be treated to become stronger than steel in certain places. This is done by increasing the thickness of the aluminum which, because of its lower density, can be made much thicker without surpassing the weight of an equivalent amount of steel. According to Reyes, aluminum also provides better resistance to dents and dings, and the trucks’ replaceable panels make cosmetic damage easy to repair. However, serious collision damage is where repairing the new F-150 gets a little tricky.Even though Ford assures that the truck is designed to work with conventional repair techniques, the same processes as steel can’t always be used with aluminum, especially with serious body damage. 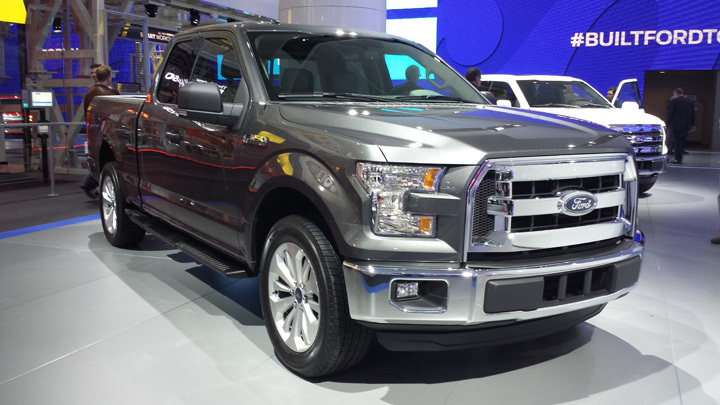 This month, Ford began production of its new aluminum-bodied F-150. However, industry insiders report that fewer than 10 percent of the professional collision shops in the United States are certified for aluminum repair. Aluminum is also prone to contact corrosion from the mixture of steel and aluminum, and the process of fastening replacement parts is completely different than with steel. This means potential problems for aftermarket and repair shops that lack the training and technology to work on the trucks. As a result, preparing shops for the F-150 represents a potentially significant investment for shop owners. Aluminum requires specialized welders, riveting to attach body panels, and special adhesive capabilities that aren’t used with steel. To counter this, Ford is laying groundwork with training programs and educational centers to help collisions shops certify in the welding and repair of aluminum. The training includes MIG welding and its application on the 2015 F-150, including equipment, consumables, electrode alloys, shielding gas, and surface preparation. Ford’s target is to have quality repair available within a two hour drive of 90 percent of F-150 buyers. Only time will tell whether the aluminum bodied 2015 F-150 will prove popular enough for shops to warrant change, but shops that are already certified will likely have a serious edge over the competition. Remember, the F-150 is one of Ford’s most popular vehicles. We’ll be sure to report on this again once it’s clear how buyers and shop owners respond to the major change, but for now the trucks’ controversial new body is a pretty good reminder of how important it is to keep an open mind toward change and develop a flexible skill set to get ahead. If you’re interesting in expanding your welding skill set, we recommend you visit American Welding Online, where you’ll find online courses, virtual lectures, a link to our YouTube channel and other digital tools dedicated to helping you advance your welding career. What do you think of Ford’s decision, and the steps they’re taking to deal with the side effects? Let us know in the comments section below. Previous PostCommon Core and the Academic/Vocational DivideNext PostWhat Does a Certified Radiographic Interpreter Do?